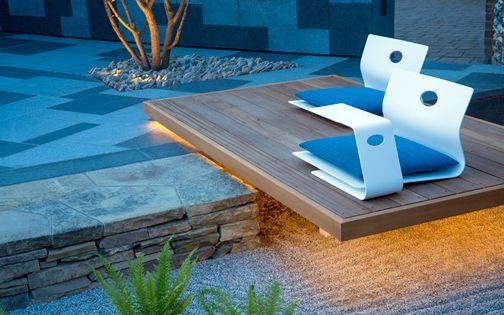 A unique bench transforms an ordinary garden spot into a personal expression of renewed outdoor freedom. 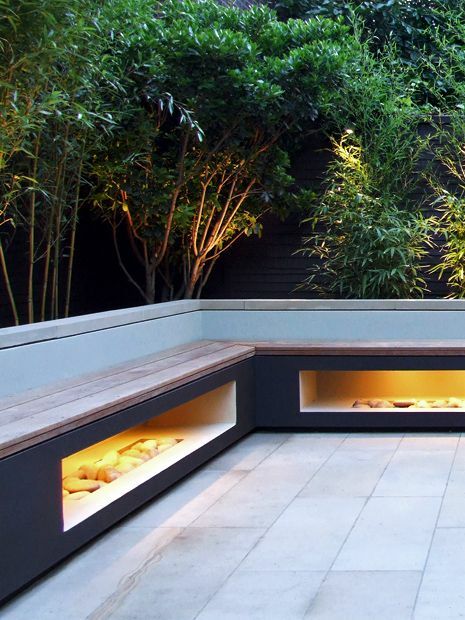 Many of the garden benches we design are built-in, forming integral parts of thoroughly modern frameworks, where we seek warmth and repose in a seating's layout, creating highly architectural, inviting and cosy outdoor settings. 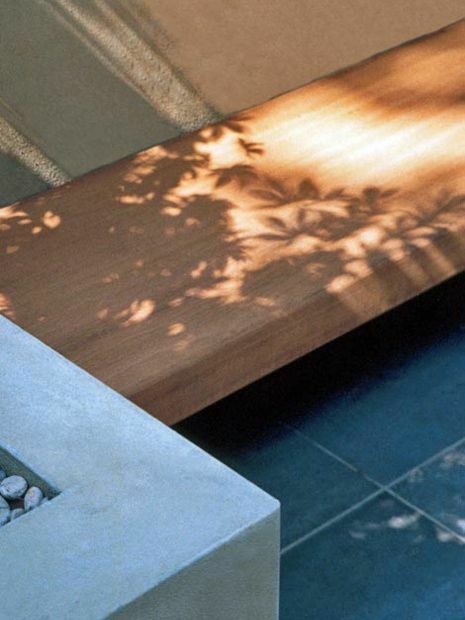 Often, bench structures fulfil multiple functions, such as storage, daybeds, or lighting features, where designing exclusive bespoke elements – a garden bench in particular, is always enjoyable, providing a platform to originate fresh details, develop a nexus of distinct materials, and quite importantly, sustain ergonomic comfort in spatial connectivity. Having retained all of the garden's existing plants, we designed a diagonal surface layout to conserve mature trees, and as a contrast to its angular outlines, we detailed a sinuous steel bench around a tall Palm tree trunk with a 10mm profile, which produces a lightweight, contoured silhouette. We powder coated the structure, and matched its colour to a pair of bespoke curved vases, enhancing continuity, where LED lights emit a warm afterglow, concealed discreetly below the seat – augmented by a state-of-the-art control system. 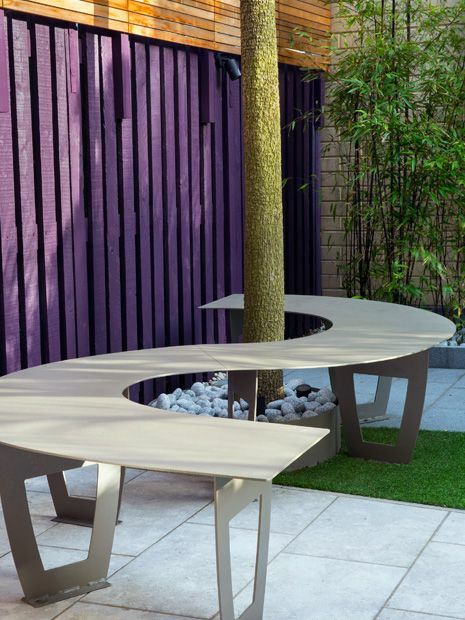 These dual benches form the centre of a Mediterranean garden in Islington; their orientation produces a subtle Yin and yang ambience. The front elevations are punctuated with square, blue glass blocks, where this hue repeats surrounding azure walls, and contrasts the garden's warm ochre tones. We detailed Cedar seats into removable top sections, enabling easy maintenance of spotlights, while low-voltage lighting generates delicate reflections through the glass, defining a subtle, captivating nightscape, amid a contemporary Mediterranean setting – enveloped by architectural Palm trees. 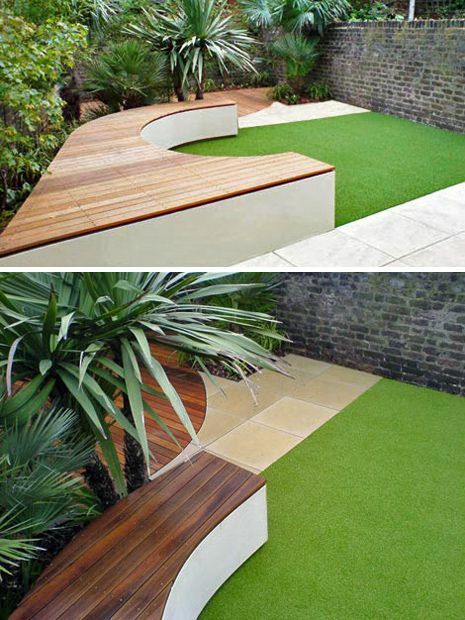 The design concept for this roof terrace bench was inspired by an elegant bluestone dining table. We replicated similar dimensions and stainless steel detailing in the bench uprights, where angled patterns align with the paving's layout. 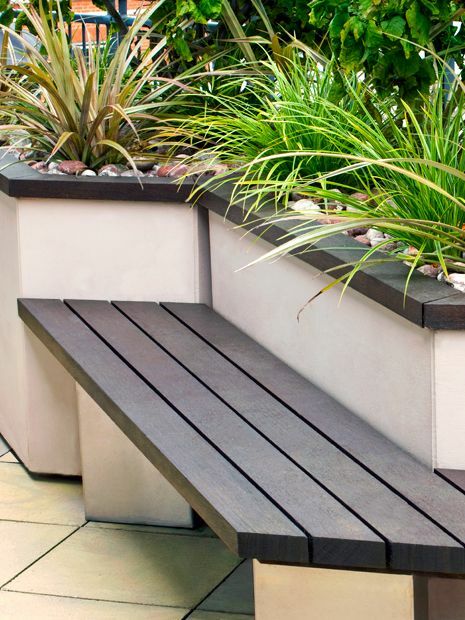 Smooth Iroko sections produce warm, continuous cladding, detailed further across the raised beds' coping, while articulating a linear hard landscaping scheme which expands this narrow rooftop terrace into a well-balanced outdoor space. 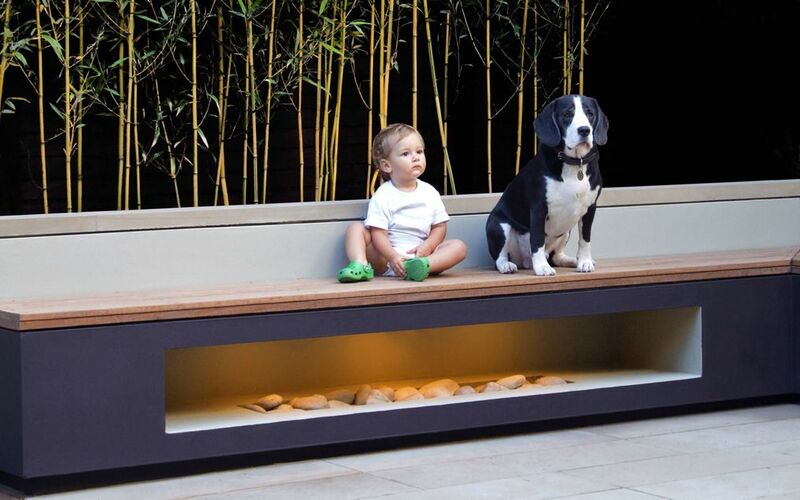 This bench design was inspired by the shape of an interior recessed fireplace, inspiring a seamless indoor-outdoor garden layout. Utilising structural concrete lintels, we suspended the seat across supporting columns, reiterating the interior's aperture. By coating the elevation in a purple hue, and adding cavity lights, the bench transformed into a radiant, sculptural focal point. 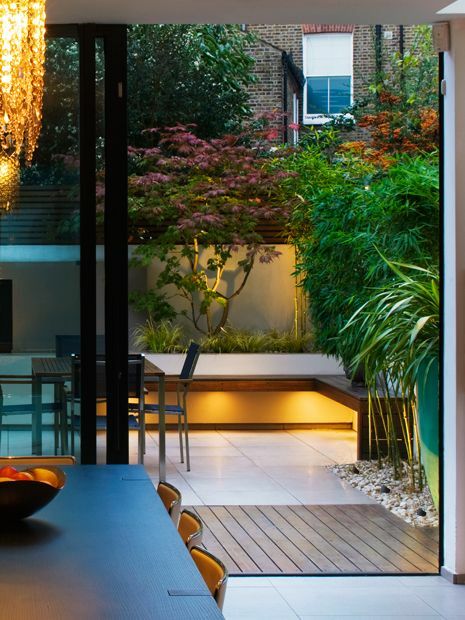 The minimalist outline and internal glow generate streamlined fluidity among lush architectural foliage, while smooth Ipe hardwood is enhanced by warm natural sandstone, enveloping a contemporary subtropical London town garden. 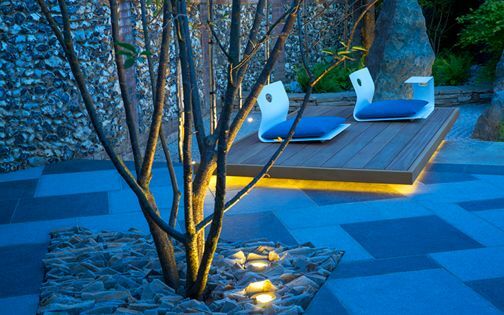 The outline of this cantilevered bench repeats the patio's angular pattern, spanning the garden's full width. 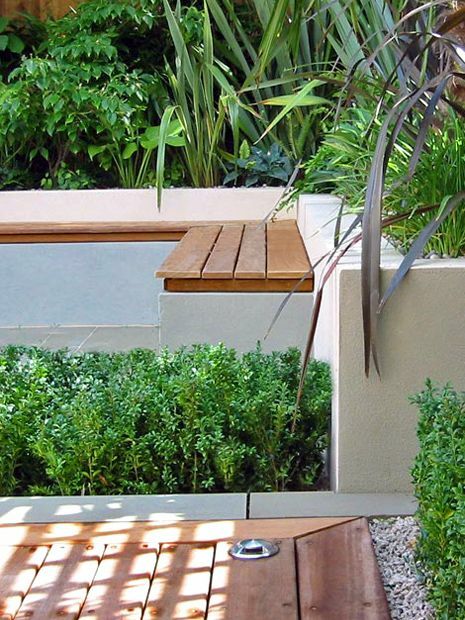 A steel frame was built into the raised beds' concrete walls, with Balau hardwood cladding as a smooth seat. 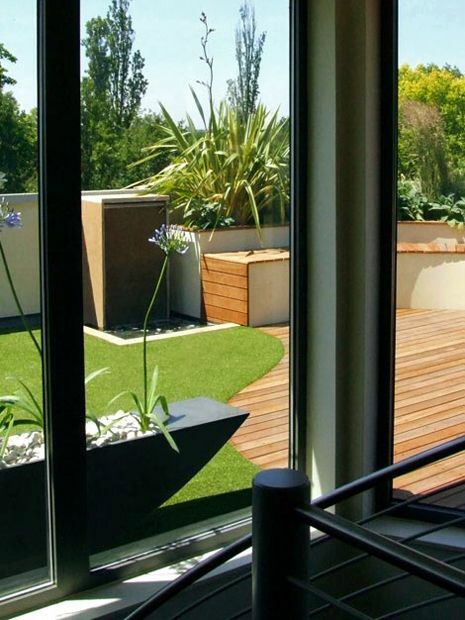 The layout increases sense of depth in this very small patio garden, as a floating shadow forms in the cavity, moving along the sun's arc during the day. At night-time, lighting transforms the seat into a radiant hub, while ergonomic comfort is achieved with further legroom, a dining table space and a useful upper shelf. 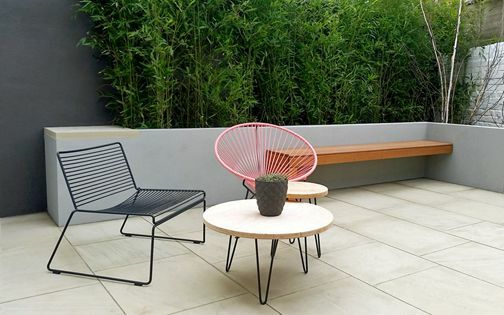 This large roof garden follows the building's gentle curve, echoed further in a built-in wooden bench, where the idyllic view of a nearby park presents the backdrop for a comfortable hub. The 4-metre long structure provides a great spot to soak up sunshine and immerse in expansive skyline panoramas. 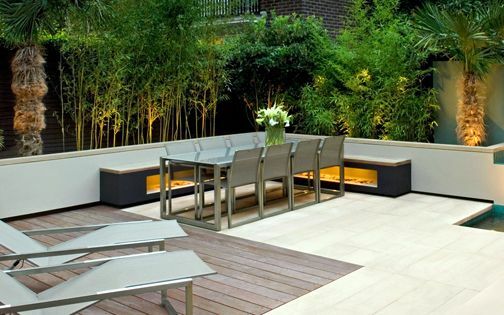 The bench forms part of a larger raised bed, and culminates in a small waterfall and pool, enjoyed often as a spacious daybed in this roof garden suntrap setting. 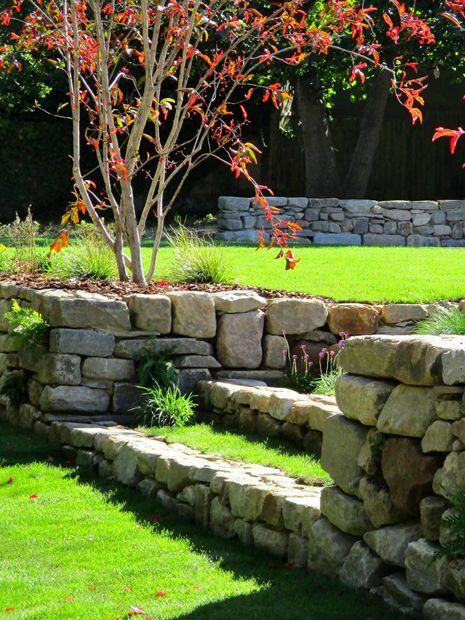 We designed gentle curves in this large Clapham garden to enhance fluidity and lead towards a subtropical spa hideaway. Located at the garden's centre left, a semi-circular bench forms a spacious lounge area for a large group of guests, alongside an artificial grass section. The seat's curvature transforms its structure into an extended daybed, providing ample space for a variety of outdoor social settings. A fitted shadow detail under the Balau cladding, matched with the bench's floating plinth, articulate this built-in hub's elegant contours. Solid Iroko hardwood, 80mm high and 500mm deep, forms the seat of this unique, cantilevered bench in a Kensington garden. 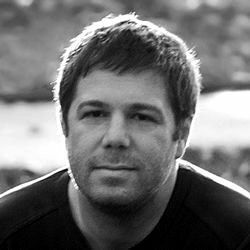 The elevation was built in three fitted sections, creating two ninety-degree turns, where we sought an entirely cantilevered appearance without visible fixings. Outlets were prepared at the back of the wooden segments, linked by metal posts, which were supported into the raised bed. The design of this solid bench enhances the project's architectural approach with sturdy elevations of rendered concrete. This L-shaped corner defines a socialising area among lush textural foliage, where its position presents a perspective of the entire garden, enveloped by pendulous Willow tree branches. 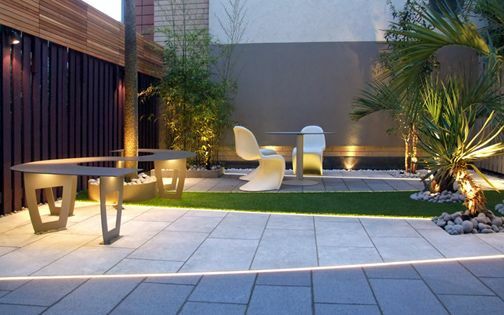 When adapting these patio design ideas for smaller city gardens, we often utilise a wrap-around bench layout to maximise every inch of available space to form intimate, functional outdoor hubs, and express the garden owners' penchant for frequent alfresco socialising. 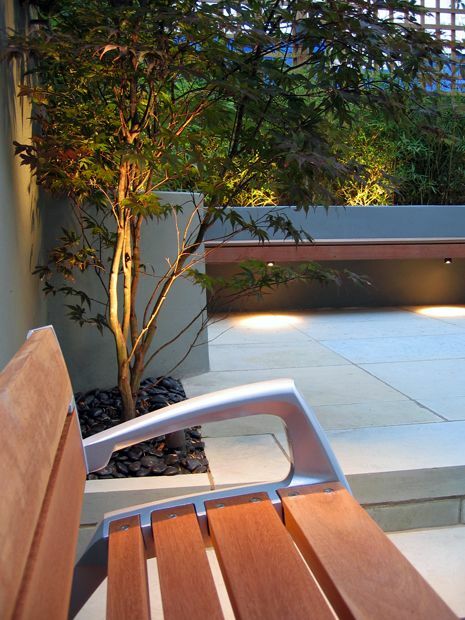 An elegant Balau hardwood bench forms an L-shape pattern by a granite waterfall design. The upper structure is built into the raised bed, while uprights are supported by the tiled patio surface. 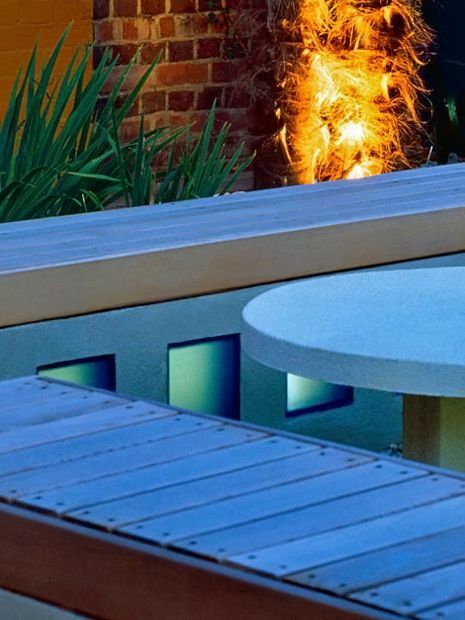 Cladding on all sides produces warm textures, while outdoor lighting defines a spacious, ergonomic cavity at twilight. The inherent flexibility of wood materials sustains an effortless in-situ construction process, enabling us to merge on-site tweaks with optimally fitted, built-in frameworks – enhancing core courtyard design ideas with usability and contrast. 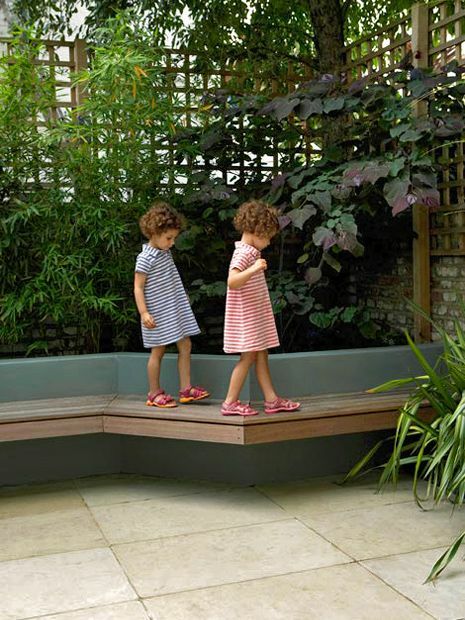 There's a bespoke bench design in every architectural town garden and urban roof terrace we create, and we remain fascinated with the unlimited possibilities, expressions and ergonomics of this object of comfort, refinement and respite. 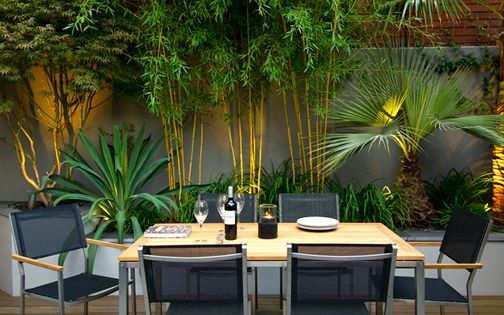 This personal, diverse outdoor perch, when skilfully designed, integrated, detailed, planted and lit, forms an intimate and distinctive space within cosy, liveable garden settings.